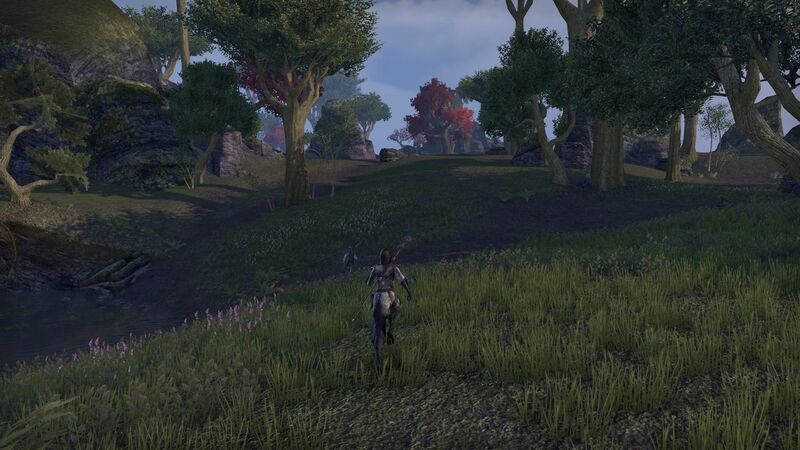 With the troubles in the past 4-6 weeks, mainly consisting of sickness in the family and our china visit, it has been quite some time since i visited Elder Scrolls Online in a normal way- that is to say logging into my main character and continue questing where i left off. Even when i logged in, i wasn’t able to do much because of short sessions, the longer ones have been reserved for guild evenings. There’s something that became very apparent in this time: MMORPGs need some commitment to enjoy them in their full capacity. At least for me, when i lose momentum in a game, others become more alluring. Lately, i’ve found myself wanting to play The Secret World or Lord of the Rings Online- i’m not counting EVE in here, because that came as a surprise and i do think two MMORPGs work very well together. Nonetheless, yesterday i decided to spend the night in Tamriel and i’m really glad i did. My first mission was to get the birthday cake, although i don’t need it much- i’m outleveling content anyway, so there’s actually no need to get that 100% bonus. But on the other hand- why fret about it? It’s only going for a week and a boost is fine- after all, it doesn’t say “you have to skip content if you use it” in the item description- i can still go for those zone achievements i want to clear before moving on. As a matter of fact, i’ve only now set my first steps into Greenshade, so there’s still a lot of zone to cover. Getting the birthday cake is quite easy- you’ll get ingame mail, a voucher for one of these. You’ll need to seek out Chef Donolon at the docks of Vulkhel Guard, who will tell you to get a few bananas, honey and…rye, i think, which you can buy from an NPC nearby or loot from the usual places like baskets etc. When you return with those ingredients, he’ll make the cake for you and it goes straight into your collections tab. I’m not sure if one has to use it to get the experience bonus, but i did it, just to make sure. After that, i could go out and seek adventure again. It took about five minutes to make me fall back in love with ESO again, as its storytelling is really good. All i really did yesterday was one quest- The Witch of Silatar. I lost track of the storyline, but i guess this is about the Wilderking wanting me to get to know the assassin sent by the Veiled Heritance, Aranias, sent to Greenshade to kill the Wilderking. But it doesn’t do this in a direct way, no. The quest NPC, Spinner Maruin, wants to tell me a story- a story i can take a part in. I would visit Aranias on the island of Silatar (which she created, by the way) to relive some part of her past as her friend- a friend she never had in her real past. She had to go through this all by herself. After i asked nicely, Maruin told me to sit by the fire- a few lines of dialogue later, and i’m on Silatar, which is strikingly beautiful. This is enhanced by the fact that the first thing i do with Aranias is racing to a lighthouse- this seems so innocent, so beautiful, at first, but takes a bit of a darker shade when she roots me as soon as i might come close to her. Still, it was this moment where i thought, again, how great the experience in Elder Scrolls Online is- this is a crafted story, not a thrown-in quest. The island of Silatar, for instance, is only visited for this quest. While it’s not big, i guess it tells us something about storytelling in a game when the developers create a zone of about the size of a city just for one quest. 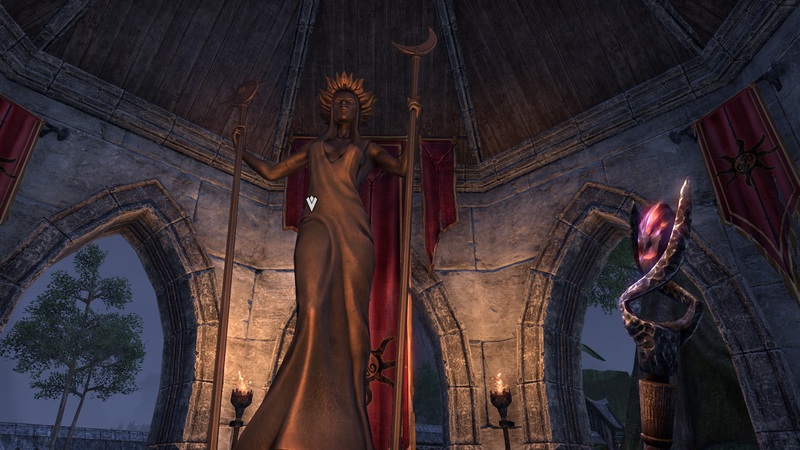 The story goes on and it’s mainly about Aranias, a young Altmer with incredible powers- after all, she created the island we’re standing on during this quest in a day. The motives for her behaviour are loneliness as well as a will to “earn” her parents’ love who really don’t like seeing her daughter creating islands or lifting ships from the sea. 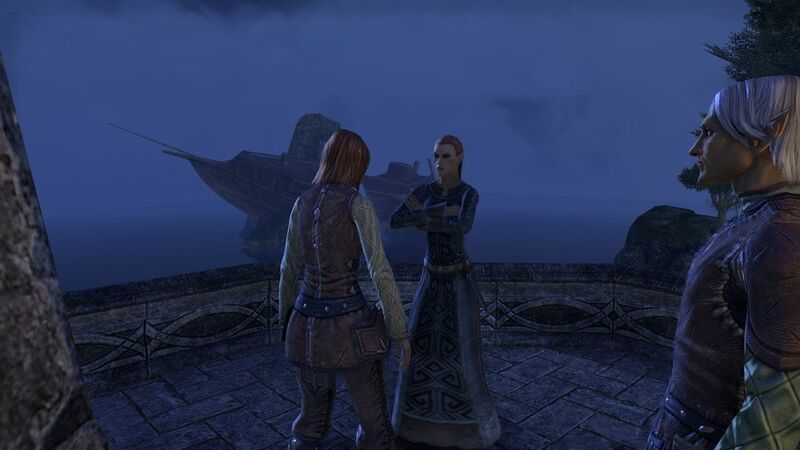 Her parents then leave for the Summerset Isles to get help for her daughter and return with High Kinlady Estre from the Veiled Heritance who makes Aranias kill a bosmer woman. In the story Maruin tells, we are able to help, so this is not what happens in our quest, but what happened in reality. I don’t want to get too deep into the details here because spoilers, but this is an interesting quest and i’m very much looking forward to playing it again on another character and take more screenshots of Silatar. This love for detail and good storytelling is what makes stand Elder Scrolls Online stand apart from and above many other MMORPGs- there are others, of course, who have great storytelling- Lord of the Rings, FFXIV, SWTOR and TSW to name a few, but while Elder Scrolls Online might not be able to have the storytelling greatness of The Secret World, it’s actually the phasing that makes the quests more interesting- when you complete a quest, the zone changes, so you can see an impact. The game then doesn’t turn into a singleplayer experience because of its megaserver technology- there are still many players who have their map- or the part of the map you’re in in the same state as you have. That’s just so much better than the instanced storytelling of SWTOR, for instance. Just like Laeloria, Silatar and the story of Aranias (which will continue in the questlines of Greenshade) will stay with me and became one of the reasons for my liking of Elder Scrolls Online. I’ve reconnected with the game yesterday and it feels good.